For years, I have wanted to try skiing. A big believer of trying everything once and being pushed out of your comfort zone, it was one that slightly terrified me after hating a day session of snowboarding in the UK. Yet a last minute place with eleven friends on my hockey team meant I had the chance to head to La Plagne in France for a week of skiing. With last minute runs to Decathlon for thermals and frantic call outs to skiing friends for gear, I ended up muscling my way in for what ended up being one of the most tiring yet rewarding trips I have been on. Not wanting to do it on the complete cheap (which I have later been told is normally a room with 6 bunk beds, one bathroom and living on bread and cheese for the week), we opted for a stunning chalet just ten minutes from the lodge, with en-suites, a hot tub and sauna - something that would make a huge difference to our aching muscles every evening - and a chalet guy who cooked breakfast and three course dinners for us. One thing I will say is it is tiring to a whole new level. Being the only official beginner with two other girls who had skiied once before, it was a huge challenge learning to forget everything one knows about being on two feet. Taking lessons in the morning meant I started from learning how to put on and take off skis to tackling blue slopes by the end of the day and small sections of red slopes by the end of the week. Of course the more experienced lots of the team spent pretty much all day on the slopes whereas I, after having a full morning of teaching, felt it was enough to have a big lunch, a couple more slopes then heading back for wine and cake in the hot tub. What I did realise was that, having been offered a fair amount of ski press trips during the January month is that is is all about who you go with. Getting drunk in the chalet, playing cards and drinking games and going out for fine dining is only made good with the company you hold. The stunning landscapes were some that I could never get used to, with the ski lifts being the best time to take in the silence on the powdery snow, changing from a clean sheet to winding pathways by the end of the day. My ankles were raw, my knees aching and face wind-burnt but I ended up being so proud of my progress by the end of the week, even if there were a few tears of frustration. 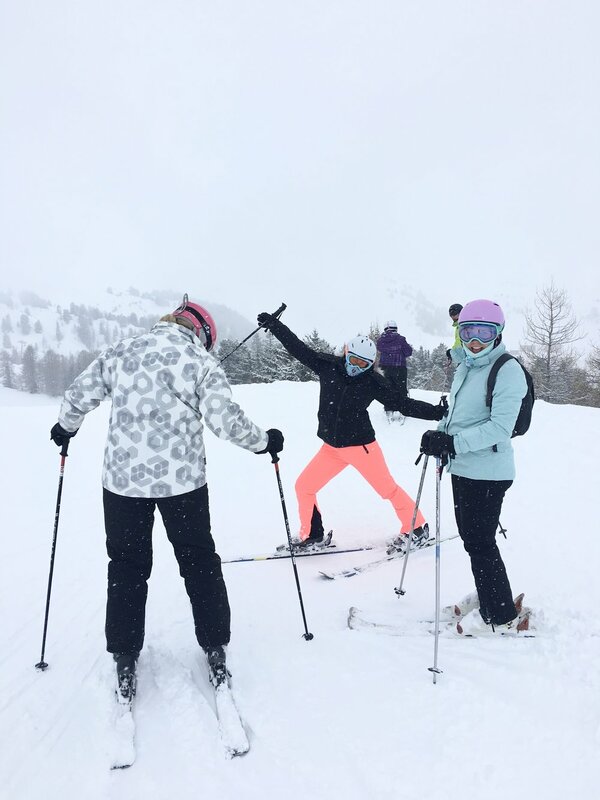 Always get private skiing lessons - Whilst pricier, three mornings with just three people meant improving much quicker and tackling slopes much earlier on than it would be if in a group of, say, ten newbie skiers. Don't go out with your experienced friends straight away - No matter how patient and lovely they are, it can sometimes be a challenge to go out without a teacher no matter how easy the slope is. It can be disheartening if going to slopes way out of your level, so give it a few days before going. Catered food can make a difference - everyone has done cheap holidays living on sandwiches but having a hot breakfast and three course dinner every evenings isn't just better to warm up the body but also works out as a somewhat bargain when looking at the prices of the meals on the slopes. Hot tubs and sauna are also a great choice - first time skiers are going to feel the pain much more seeing as they are using muscles they never had, so spending every evening in the hot water means it is easier to keep going for the whole week. Don't buy expensive gear - for people who have never been before, they may end up hating the entire experience. So buy cheap stuff and borrow until knowing if it worth it for another trip. Decathlon is great for thermals costing just £2.50, whilst salopettes, goggles and ski jackets should be borrowed, otherwise can cost a pretty penny even from Sports Direct.